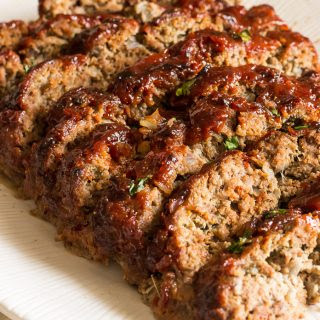 "Yasss" may be the only word you utter after your chomp down and savor the bursting flavors of this delicious classic, tender, and moist meatloaf. Preheat oven to 350 degrees Fahrenheit. Cover the entire top and sides of a baking sheet with heavy-duty aluminum foil. Add the vegetable oil to a medium skillet over medium heat. Once the oil is hot enough add the onions and cook until softened about 6-8 minutes. A minute before the onions are done, add the garlic. Cook until fragrant (about 30 seconds). Remove the onions and garlic from the skillet and let it cool for about 5 minutes. Get a bowl big enough for the ground beef and breadcrumb mixture. Add the ground beef to the bowl with all the seasonings, salt and pepper. Add the breadcrumb mixture, onions and garlic and gently mix. I used plastic gloves to mix. You can use a fork if you like. Do not mash or overdo with mixing or the beef may get tough. Place the beef on the baking sheet lined with heavy-duty aluminum foil. Shape the beef into a loaf. Pour half of the brown sugar ketchup over the meatloaf. With the basting brush, brush the ketchup all over the top and side of the meatloaf. Reserve half of the ketchup. You will add the rest of the ketchup once the meatloaf is done. Place the meatloaf in the oven. Add another baking sheet on the lower shelf right underneath the meatloaf. Fill it with water. This will help keep the meatloaf moist. Bake for 45-55 minutes or until the temperature on your meat thermometer reads 165 degrees Fahrenheit. Add the rest of the ketchup and serve with mashed potatoes and vegetables. Do not overmanipulate the ground beef. Gently mix the ground beef into the seasonings and breadcrumb mixture. 0 Response to "THE BEST MEATLOAF RECIPE"